Toshiba BDX2000 review | What Hi-Fi? An old Spanish proverb holds that "a wise man changes his mind – a fool never will". Kudos, then, to Toshiba for proving to the world that it isn't, after all, a bit daft. The BDX2000, the company's first Blu-ray player, has hit the streets, and with it, the ghost of HD DVD can finally be laid to rest. That said, the BDX2000 bears all the hallmarks of a company playing catch up. It's competitive without being spectacular, its pricing a sensible reflection of a specification that's underwhelming next to the best in class. 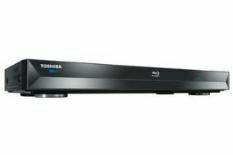 No wi-fi, no built-in memory, no provision for DLNA or USB media replay and no multichannel analogue outputs: save for an ethernet input and an SD card slot, the little Toshiba is basic, simple and, dare we say it, a little old-fashioned in its outlook. Yes, you can use its single SD slot to replay various digital media files or display digital photos, but there's only one slot. Fill it with a media card, and you can't then use it for BD-Live – unlike newer players, which include either built-in memory and a USB slot (LG, Philips) or two USB inputs (Sony). The Toshiba, too, is comfortably slower to load than its rivals – another clue, the cynic might say, to the relative age of its design. Good job, then, that the picture and sound quality is up to par. The Toshiba can't rival the Sony BDP-S560 for detail and sharpness, but it's perfectly enjoyable, especially with a clean, colourful transfer such as Up. Edge definition is very good, background noise is minimal and, while there's a slight hint of motion judder in very fast panning, stability is generally fine. In typical Toshiba fashion, it's also a very capable DVD upscaler. However, both the LG BD390 and Philips BDP7500 have denser colours, more black depth and, overall, more vitality to their pictures. Sound quality is equally acceptable, in that the BDX2000 favours a richer, meatier sound than the BDP-S560, and can muster more low-frequency extension than its Sony rival as a result. Big explosions in The Hurt Locker have enough drive to satisfy, and if you lose some of the Sony's exemplary clarity in the mix, we think most will find this an acceptable compromise. Overall, though, this Toshiba's time is already up. In our February issue, it earned four stars. A month on and, thanks to the launch of two price rivals that surpass it in every aspect, it's demoted to three. This is a fair player – but no more than that.